Investing in culture can create jobs, fight poverty, improve skills and promote tourism. 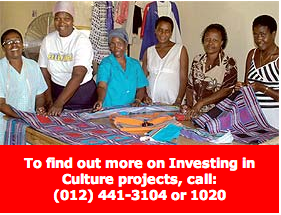 A programme, called Investing in Culture, was started by the Department of Arts and Culture. Money is given to projects that empower communities. It trains people to make art and craft your items and to take part in cultural performances like dancing and singing and making money out of this. Through the department's projects, thousands of people countrywide who had no income, can now support their families. Some make and sell articles like beaded crafts, sculptures, clothing and pots. Others earn money by taking part in performances that attract tourists. Some of the products are sold in big clothing shops around the country. They are also sold and exhibited overseas.. These projects are in line with the Expanded Public Works Programme. This, in turn, is part of the Accelerated and Shared Growth Initiative of South Africa (AsgiSA). The Investing in Culture programme is also part of a government effort that gives skills training to help create jobs and develop communities. There are now 146 Investing in Culture projects countrywide. The Department of Arts and Culture budgeted a total of R88 million for these projects last year alone. Until now, more than 2 480 jobs have been created. Many of these jobs were given to unemployed women and youth. Consideration has also been given to disabled people who are also included. Some of the Investing in Culture projects in Gauteng and in the Western Cape have won awards for contributing to and improving people's lives. Arts and Culture has improved the quality of lives of many disadvantaged people by creating employment. People in the project must be from previously disadvantaged communities. Projects must be about arts, culture and heritage. People in the project must have the ability to learn new skills. Products and services should be of a high enough quality to be sold locally and overseas. Projects must be owned by community members and must directly benefit them in terms of jobs and training. Projects should support and promote tourism. Projects should give preference to employing women, youth and disabled people. 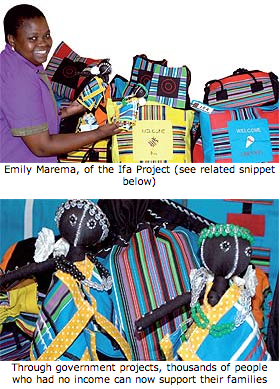 The Ifa Craft Project in Thohoyandou, Limpopo, is one of the most successful Investing in Culture projects. Ifa is a TshiVenda word meaning "legacy." Twenty women from villages around Thohoyandou are part of the project. They make products like handbags, shopping bags, cushion-covers, tablecloths, mats and pillow-cases using the colourful TshiVenda traditional cloth called 'nwenda'. The project received R500 000 from the Department of Arts and Culture for training, marketing and general operations last year. 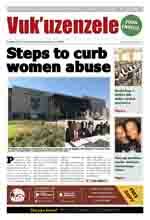 Project manager Emily Marema said all the women were un-employed before the project started. The department asked the municipality to find people who could be trained to make crafts. They chose us and sent people Vendafrom Pretoria to train us for a few months. "Our project made more than R140 000 last year. We are now able to provide for our children and send them to school. Some are even building better houses for their families," Marema said. "Shops in big cities like Johannesburg and Pretoria are now ordering Ifa products." "I have also been to Germany, the United States of America and Italy to sell and exhibit the products."